17 mi on the big block & the Mt Rd. I took a snow day today. We got almost 15” of snow over night and throughout the day with the possibility of an inch or to tonight. I spent the day pushing snow at home and with my closest neighbors. I will count today as a rest day and pick up today’s scheduled training run tomorrow. 7 miles today in hill training mode. 23*, lite breeze, 65% humidity, some sunshine. 7 miles on the PRTrail. 23*, 69% humidity, 7 mph wind...not a bad day. 66 days till what ever Boston’s weather will be!!! 7 recovery easy miles on the Mt. Rd.....20* degrees, 7mph wind - 13* with wind chill, 6 inches of fresh snow to put up with. At least the sun was out and fooled you into thinking it was warmer ! 4 tempo miles, 25*, 12 mph wind, 50% humidity. I’m so ready for spring weather. We’re expecting another 3 ft of snow between Wed and Sun. That could mean 6 to 12 inches in the foothills around me! 7 easy hill training miles on the Porter Rockwell (PRT) Trail. 80% humidity, 27 to 47 mph winds with rain and snow falling, felt like 18*. 61.5 days till Boston! 4 easy miles and a super fine full body workout in anticipation of a 10 mile speed trainer on Friday morning. Sunday I’m kicking out my first 20 miler in my training schedule for The 123rd running of the Boston Marathon, 59 days and 14 hours from now!!!! Hope I’m ready! 5 easy miles on the big block, Full body w/o at the gym. 6 miles on the big block, 1 w/u, mile repeats (4 X 1), 1 mile cool down. 25*, 68% humidity, 19 mph winds. 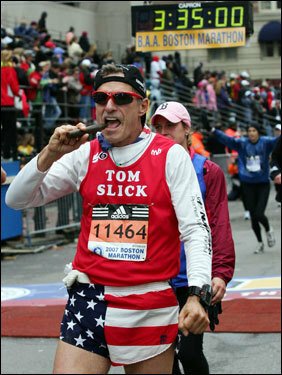 53 days 22 hours till Boston, do you know where your running shoes are? Rest Day- 3 easy aerobic miles then a full body workout at the gym. 3 aerobic miles and a full body workout! 7 miles in the hills.....and a FB - W/O at the gym.